Shalom Hair Braiding employs experienced and dedicated Hair braiders that deliver the best hair braiding experience to each customer everyday. Our job at Shalom Hair Braiding is to make you look great. We are sure that you will be more than satisfied with your braids every single time..
We braid every Hair Styles with Quality. We specialize in different kinds of braids including Box braids, Micro twists, Cornrows and other braiding trends like Lemonade Braids, Poetic Justice Braids, Halo braids and others. Simply tell us what you need and our experience team will get you the exact look you want. At Shalom Hair Braiding we stand out with our affordable prices, qualified braiders, a comfortable salon, and great customer service. We are sure to give you a wonderful braiding experience. Looking for the best hair braiding salon in Stone Mountain GA and nearby? 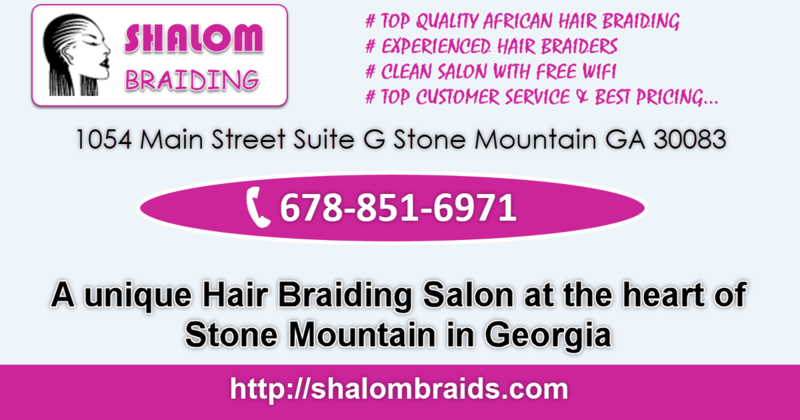 Shalom Hair Braiding is the best Hair braiding Salon for you. Come find out why our customers love us. Choose Shalom today. You will love us!